According to legend, one of the ancestors Leung Ji Ban, was the bodyguard of a high official in the Ching Dynasty. Later Leung Dong Gau again led the villagers to fight against the Ching government, was uncovered and searched. He later fled to Hong Kong, continued north and eventually joined in 1911 to the Revolution and died for their country. Cheng Wan Tong, a company founded in the late days of the Ching Dynasty, was a charitable organization and at the time of the family clan Leung initiated the construction of the lighthouse, roads, allowing children to attend school, organized treatment of the sick, etc. etc. The prestige Leung Ga Mou Gun was revived in 1940 by Leung Yeun Ming. Leung Yeun Ming (1914 – 1996) was born in the family as the fourth, also known as “Leung Sei” (Leung Fourth), was a devotee of Choi Lei Fat, and Northern Shaolin Hung Ga. He was famous instructor in the city and even in his 80 years, defended the assault victim, when her two robbers wanted to steal her purse. After the war and political turmoil in the 1960s took over the family school from the hands of Leung Si his son, Leung Wai Choi sifu. Under his leadership experienced Leung Ga Mou Gun boom in full swing. 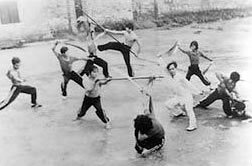 Leung Wai Choi was born in 1941; when he was 6 years old his father began to teach him martial arts. Leung Wai Choi joined the local Wushu team in Jiangmen in 1953 and thereafter repeatedly won the title of provincial champion martial arts. In 2003, Sifu Leung attended in his 62 years of age an martial arts tournament in Hong Kong and took gold and two silver awards. 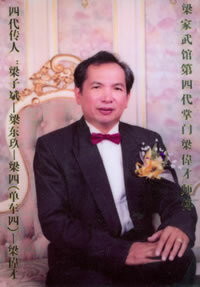 Leung Wai Choi is a former head coach of city Wushu Team, Vice President of “Siuhing Martial Arts Association” , President “Lion Dance Association, head coach of “Hong Kong Blue Cloud Hall, Dragon and Lion dance Group and martial arts school” and mastered several styles of Chinese martial arts that are taught in by more than ten famous masters. And not only excellent in martial arts – also Grand Master Leung Wai Choi attaches great importance to the heritage of Chinese martial arts and is renowned for profound knowledge of traditional Chinese medicine, Feng Shui, etc. Leung Wai Choi Sifu began to teach martial arts at the age of 18 years and today has a number of several thousand students in China and abroad. Today, after long and hard work comes great achievements one after the other. Sons and daughters, and Sifu Leungs grandchildren and pupils acquire and receive awards for both provincial and local martial arts competitions and Lion dance, but also international in Hong Kong. Leung Wai Choi sifu began learning WingChun from father of his wife, Taam Hou Chyun sifu and learned from him 18 years at last Taam sifu said he hadn’t anything more could teach him. Taam Hou Chyun sifu was a student of the famous master Dang Syun, who taught him the style of his teacher, Fung Siu Ching – an master of ancient Wing Chun version from “Red Junks”. 7. 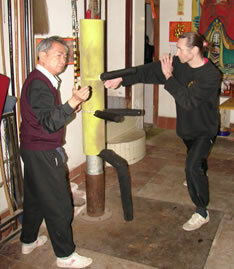 Taam Pui Chyun, Baan Jung Wing Chun Kyun, Tong Long Kyun, Taijiquan. About the Author: Ivan Rzounek sifu has started to learn martial arts in 1976 (Greco-Roman Wrestling), in 1983 he has started with Shotokan Karate. Since 1988 he trains Wing Chun. Ivan Rzounek is a disciple of Grand Master Leung Wai Choi since 2009, learning Baan Jung Wing Chun (full name “Siuhing Fung Siuching Baan Jung WingChun), Lion Dance and as he says: “Anything Sifu shows to him”. 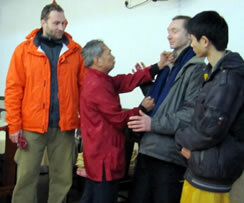 Please visit the webpage of his School and Wing Chun Research, as well his school’s Facebook page and YouTube profile. Great article and great lineage!